Hello again and welcome back. 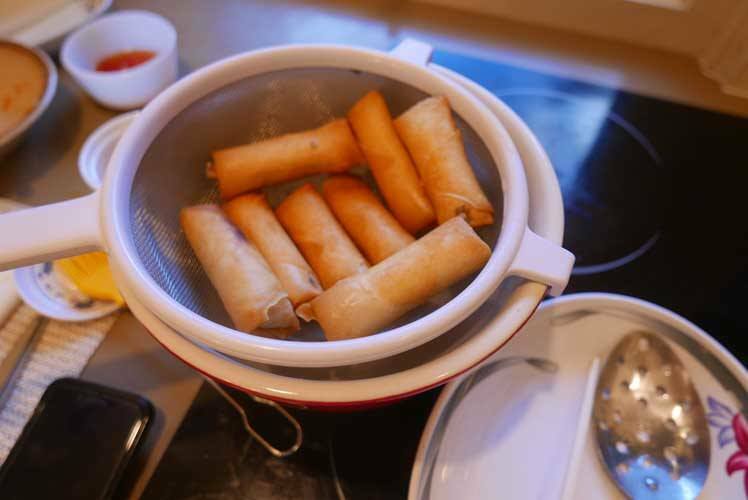 We are pleased to share a new recipe which is so simple to make and flexible according to your own taste buds -- take a look at our Fried Spring Rolls. We also have a new shipment of fresh red Thai chili peppers, a new Tom Kha Paste, green curry paste, and more. Thanks for visiting! Made really quickly, as the filling is so basic and things are put together using eyeball rather than strict measurements. Have fun developing your own style. We make several dozen then keep uncooked rolls in a ziplock frozen. Use this to make a quick and delicious Tom Kha soup. All you need is to add coconut milk, and your own chicken & fresh mushrooms. Another shipment of nice red Thai chiles with nice and strong, true Thai chili heat. Fresh pick. We had sold out of our last shipment quickly and had to wait for these. Supplies limited again. Available on a seasonal basis. Our best handmade Thai knife is still in stock, we have just a few dozen left. This is a serious, heavy-duty handmade cleaver in a traditional design, and a great value. Should last forever. Total weight is 22 oz (nearly 1.5 lb) because the high quality steel is really thick, but also well-balanced. We had to wait several months to get more of these and we don't have a lot in stock so order now if you want a really good heavy cleaver. This is a "gourmet" green curry from Aroy-d, our top choice for curry paste based entirely on flavor and quality control. The flavor is more gentle and mild, but you can add your own fresh Thai chiles to make the heat level higher. Product of Thailand.